I’m trying to catch up on this title, but failing, as this review of a Halloween issue indicates. Earth’s two Green Lanterns, Jessica and Simon, are looking for a rogue Guardian of the Galaxy who was, until recently, hiding out with them. Then that Guardian learned he was being sought by two of the dangerous aliens called Dominators, which spooked him, so he went deeper into hiding. The Dominators are after his Phantom Ring, the only one of its kind. Unlike all the other power rings, this one can be used by anyone who picks it up. With such a powerful weapon, not a great feature. The issue gives Simon and Jessica time to go trick-or-treating with some of their young relatives, while searching, and that makes for fun and funny reading. When the Lanterns finally find the Guardian, things get serious quickly. This is one of the best comics from DC I’ve read in some time. It hits a lot of bases and adds to GL history, yet is pretty self-contained and easy to understand. The character interplay is excellent, the plot clever and unpredictable, and the art is perfect for this story. 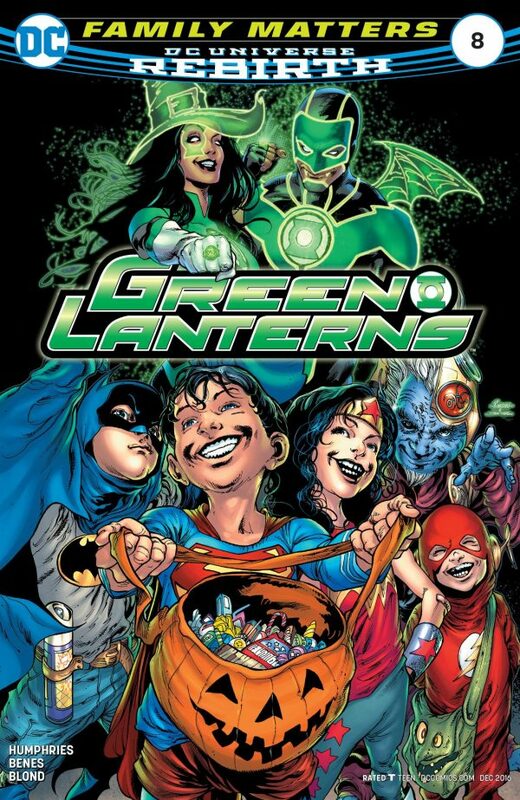 Great job by Sam Humphries and Ed Benes, looking forward to more. This entry was posted in Comics, Reviews on March 1, 2017 by Todd.